2015-up Dodge Challenger Ghost LED Front & Rear Side Markers Dodge Challenger Ghost LED Side Markers, 2015-up Dodge Challenger Painted LED Side Markers, Challenger Painted LED Side Markers, Dodge Challenger LED Side Markers, Challenger Plum Crazy LED Side Markers, Challenger Black LED Side Markers, Challenger Light [Oracle 9860-504 LED Side Markers] - $429.95 : 3rd Strike Performance, Your Source for Late Model MOPAR Performance Parts and Accessories! 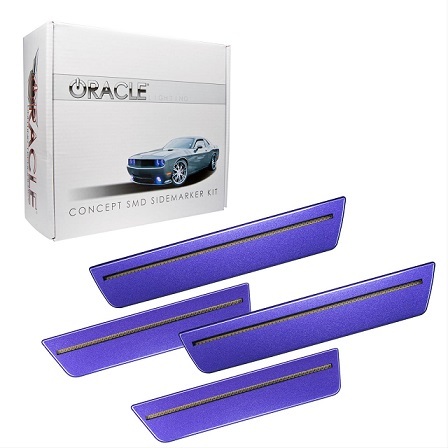 Be the first with these lights designed for the 2015 and up Dodge Challenger, ORACLE Concept SMD Side marker lights are complete side marker replacements fitted with high powered 2835 Bridge lux LEDs that produce a laser-like appearance. Installation is easy! Just pop out the factory side markers and connect the new ORACLE Concept Side markers right into the stock connector for a "Plug and Play" installation! These Side markers are C.A.D. developed for a factory fit and finish. Guaranteed perfect fitment! The seal is done with an ultrasonic weld, which insures there are no moisture issues ever with these side markers. Note** order can take from 2-4 weeks processing time as they are custom-painted-to-order. Disclaimer: ORACLE Lighting offers these parts professionally painted to order. We strongly recommend using this painting service when ordering these parts. If you choose to paint these products yourself please note that parts not properly painted with a UV clear coat will not be covered under warranty. The clear coat protects the acrylic parts from harmful UV damage and fills any pinholes preventing moisture issues.